The ever developing technology has emerged as a boon to the societies. It has come up with acute innovation every time which has proven highly useful for the masses. One of the amazing inventions which took place recently is the Apple SIM, which has highly revolutionized the current mobile and communication systems. It was a complete buzz in mobile and communication world when Apple announced about this project. Months later the campaign came out with its newly created iPad Air 2 with 4G version integrated with innovatively designed Apple SIM. Apart from the captivating features of the gadget like ultra skinny architecture, amazing A8X CPU, the much enhanced 8 megapixel camera and touch ID sensor, the obvious curiosity for the world was about the SIM. 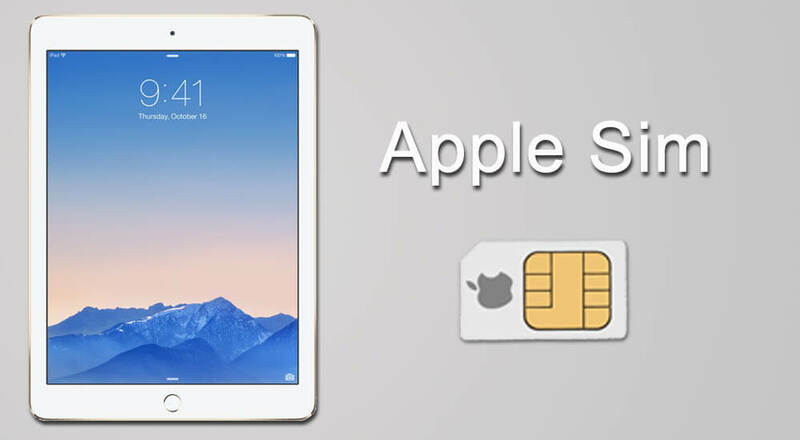 Apple SIM in general, is a standard SIM manufactured and provided by Apple which comes pre-installed in iPad Air 2. It is a multi-carrier SIM card which has been specifically configured to various signal carriers. To be more precise, a user while using an Apple SIM could conveniently switch from the current carrier to another as per the requirements. Additionally, the board of carriers would be available on the device. Hence, if you aspire to be an iPad Air 2 user you won’t be able to use the SIM card of your choice. But you would have choices to operate on various signal carriers. Apple also looks forward to collaborate with more network carriers thus allowing users to operate their tablets in various network services through single SIM. After the introduction of LTE bands, the lists of the network carriers providing services to the Apple SIM are likely to be increased. This is one of the required features which is expected by every network user. With Apple SIM you would have the freedom to roam amongst the network providers, thereby choosing the best short term plan as per your suitability. This further also keeps you free from the hassles of purchasing a local SIM while being abroad and paying high charges to your network provider. With no installation of SIM card, the devices such as phones and tablets would be designed quite sleeker and thinner when compared with their earlier versions. You could relate it with the recent releases of Apple’s iPhone 6 and iPhone 6 plus which are not too thick in their size. The thing to consider over here is that a minor change in the size of SIM card has helped to reduce the thickness of the device. Other than that, it would also result in the minimal use of batteries. As mentioned, while using Apple SIM, the users would be able to switch to any of the network providers, by changing the settings. Evidently, you won’t have to follow the procedures of removing the case covers and batteries of the cabinet just to access the network. With the Apple SIM being the source, you could conveniently change the network through device clicks without any more hassles. You won’t have to replace the SIM in order to select the network or to choose another carrier. The integrated Apple SIM would opt for the carrier as per your preference. Thus you could expect for an uninterrupted network right through the property of Apple SIM. That’s pretty uncertain. Meanwhile, it cannot be said about the existence of SIM card in future communication system. However, if considering the coming years, it could be expected that the future generation mobile devices most specifically that of Apple won’t include a SIM slot as the device would come with a built in SIM card. Furthermore, it would come with network selection phenomenon which means there would be no requirements of other SIM cards. Besides, when talking about advantages and disadvantages, it could be observed that this concept, for now, has shown more advantageous features which would also increase the success rate of Apple SIM among the users in future. As far as disadvantages are concerned, they are nearly negligible. Apple is all set with its iPad Air 2 included with Apple SIM along with network carriers in the US and UK, but the concept is yet to come in process. However, once started, this principle is likely to bring a vast change in the traditional mobile and networking systems and the future modes of communication would operate on entirely transformed methods.